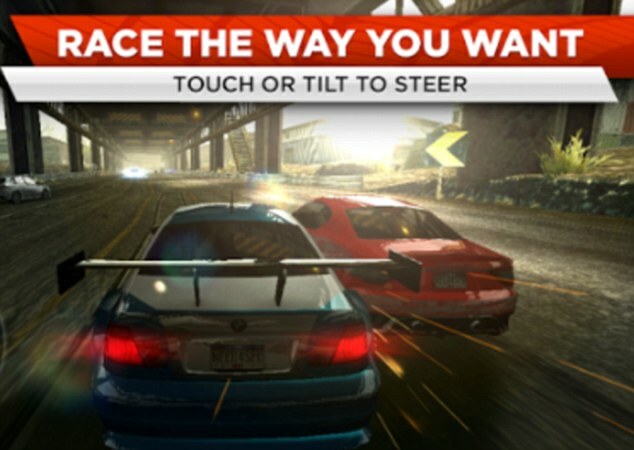 Are Apps Secretly Listening to Your Calls? Many people are careful to protect their pin numbers, and are vigilant about giving smartphone apps access to their microphone in case they could be listened in on. But now there’s a new snooping threat, and it comes from a smartphone's gyroscope. Experts say gyroscopes can be turned into crude microphones that can pick up on phone conversations with the aid of specialist software. Gyroscopes are used by smartphones for everything from screen orientation to gaming, and unlike with the phone’s microphone, no explicit permission is needed from third parties to access them. Computer scientists from Stanford University and Israeli defence research group Rafael said that gyroscopes can also pick up the frequency of soundwaves around them. Android software, for example, reads movement at 200Hz, which means its sensors can detect vibrations within the range of human voices - typically 80 to 250Hz. Apple limits this frequency range to the minimum needed for the app. During tests, vibrations were decoded using voice recognition software, making it possible for experts to eavesdrop on phone conversations - albeit less clearly than if they tapped into a phone’s microphone. When tested, the scientists found the custom-build software could identify around 65 per cent of numbers spoken in the same room as a hacked phone. The technology is not yet honed enough to pose as great a threat as a microphone. But, experts said advancing speech recognition algorithms could soon mean it could be an equally effective eavesdropping tool. 'The headlines will certainly raise alarm amongst smartphone users and certainly the refinement of the hack could represent a significant threat. 'At present however, the speech recognition capability of the software does not support the ability to capture all of what is said. The research will certainly need to be closely monitored, as better analytics software support the ability to capture more audio. The team will showcase their technique at the Usenix security conference in San Diego, California, next week. Around 88 of UK workers believe their calls and texts are being listened to, according to a survey of 1,000 Britons by Swiss-based private communications firm Silent Circle. When asked if they’d buy a phone, or subscribe to a service, that protected calls and texts from eavesdroppers, almost a quarter of Britons said they would. Vic Hyder, chief of revenue for Silent Circle suggests, ‘These figures confirm that many consumers recognise that mobile communications are no longer private. Using vibrations to gain access to smartphones and computers has become a focus for many computer scientists and security experts in recent years. Scientists have previously used an iPhone to record what was being typed on a nearby computer keyboard. Researchers at Georgia Tech tapped into its accelerometer - the internal device that detects when and how a phone is tilted - to sense keyboard vibrations. Patrick Traynor, assistant professor in Georgia Tech's School of Computer Science, said: 'We believe that most smartphones made in the past two years are sophisticated enough to launch this attack' - and it could be assumed that the number has risen because the study was done three years ago. The technique works by using mathematical software that detects pairs of keystrokes, rather than individual letters. Hackers can then determine whether the pair of keys pressed is on the left or right side of the keyboard, and whether they are close together or far apart. After the system has determined these characteristics for each pair of keys pressed, using probability it compares the results against a pre-loaded dictionary. Last year, it was proven that hackers can steal data simply by recording the sounds a PC makes. Using a microphone in a mobile, scientists were able to record the hum and whirs made by a computer’s central processing unit (CPU) as secure information was being decrypted. By then identifying the certain parts of information that each of these unique sounds related to, they were able to extract the content of private emails. This method could, in theory, also be used to steal passwords, logins or any other secure information entered into a web page. German computer scientists have proved that malware can travel between machines using sound waves that are inaudible to unsuspecting humans. 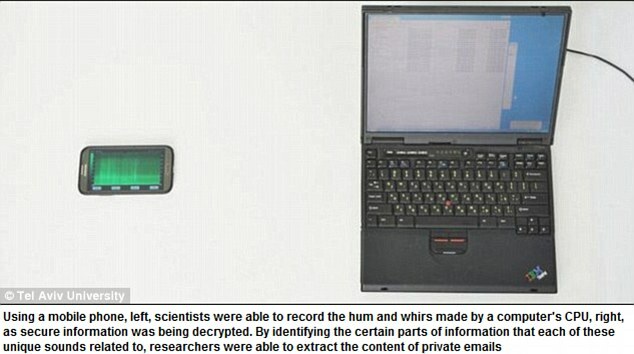 Using built-in microphones and speakers in laptops, the researchers managed to transmit passwords and small amounts of data between machines 65ft (20metres) away from each other. They came up with a hack using sound to steal data from protected machines and suggested that noise could be used to pass data between target computers and the ‘hacker’ machine.